"I kid not. 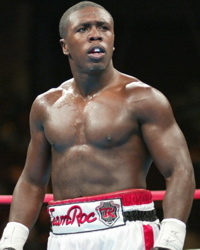 Just filed to ESPN: Andre Berto tested positive for steroid, putting June 23 fight with Victor Ortiz in jeopardy." That's two high profile fighters in the space of two weeks testing positive for a form of steroid. The weird thing is that both Lamont Peterson and Andre Berto ASKED for the random drug testing. One thing to take into consideration is that Berto had a bicep injury earlier this year, so maybe the positive test came from some of the treatment he took earlier this year. But whatever the situation is, it's strange that two high profile boxers have failed a drugs test within a few weeks of each other. For those looking forward to Andre Berto's fight with Victor Ortiz, it's highly unlikely that the fight will go ahead.